The sky was dark and rain fell steadily in Humboldt, Sask., on the morning of the anniversary of the Broncos’ bus crash. 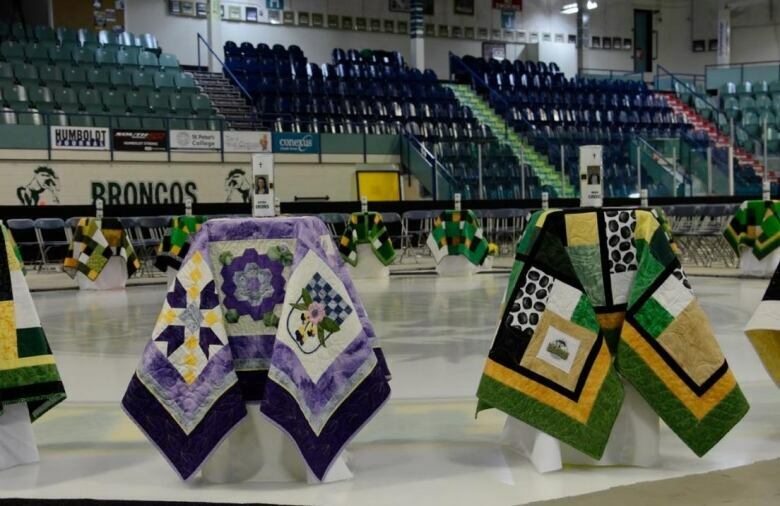 The Elgar Petersen Arena in this city will be packed with an expected 3,000 people Saturday afternoon, commemorating one year since the Junior A hockey team collided with a semi en route to a playoff game. Now, at centre ice, there are 29 candles waiting to be lit, representing the 29 people aboard the bus at the time of the crash. The 16 people killed in the crash, and the 13 others that survived, will be honoured with a memorial song from a drum group, as well as choir performances and speeches. The memorial begins at 4:40 p.m. Many of the surviving players and their families have spoken recently about how their lives have changed in the past year and what the memorial means to them. Most of the players won’t be at today’s memorial service. Instead, they’ll gather privately to watch a video of their last game together and go through photos on social media. “It will be an emotional time for sure, but it’s a celebration for me. I want to celebrate the lives of everybody on that bus and especially the 16 who aren’t here anymore. I want to remember them for who they were and for the good moments,” Kaleb Dahlgren, an assistant captain of the Broncos who survived the crash, told CBC in the days leading up to the memorial. CBC News will be covering the memorial live on its website and Facebook pages.